For over three decades, NLCC has been one of the outstanding groups at festivals across Europe. Specialising in contemporary works, we perform uncompromisingly avant garde music of all periods and have a unique record of commissioning and premièring new works for mixed chorus. 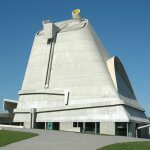 NLCC joins the London Sinfonietta and soloists under Maxime Pascal in Stockhausen’s Donnerstag Aus Licht. Further information from the South Bank Centre. 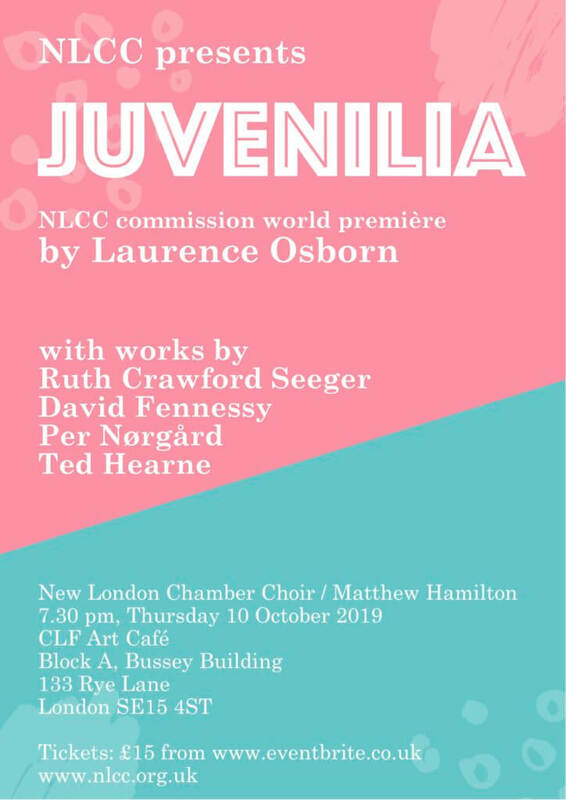 New London Chamber Choir presents Juvenilia, a major new NLCC commission from Laurence Osborn. Juvenilia examines languages and codes that children use and hear. 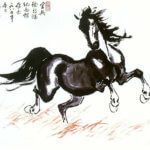 An anthology of pieces for different combinations of voices, Juvenilia combines a variety of texts: nursery rhymes, tongue-twisters, the poetry of Blake, the theatre of George Peele, traditional folk songs, texts in ‘pig latin’ and ‘uvaguv’, and numerous chants, games and insults remembered from the composer’s childhood. The musical language of Juvenilia is defined by a constant state of play: the collection transitions abruptly and freely between styles and moods; singers break role to impersonate characters, animals, and instruments. The listener should feel as though they are watching someone rummaging frantically through an enormous dressing-up box. The first performance of Juvenilia is presented alongside other contemporary choral scores that explore communication, language, relationships, and power. Tickets £15 on the door or from Eventbrite. December 2018 saw NLCC present a programme of experimental works within the Space Shifters exhibition at the Hayward Gallery on London’s South Bank. Gallery audiences were treated to works by Meredit Monk, Pauline Oliveros, David Lang, John Cage, Robert Ashley, Peter Ablinger, and Philip Glass. In November 2018, as guests of Festyvocal in Firminy, France, NLCC appeared at the iconic, late le Corbusier Église de S. Pierre to perform works by Xenakis, Dusapin, Messiaen, Macmillan, Harvey, and Britten, along with the world première of a new work by festival competition winner Julien le Hérisser. We then repeated the programme at the Siobhan Davies Studios, London SE1. October 2017 saw NLCC return to the Brandenburg Festival to explore the connections between Japanese composer Toru Takemitsu and some of his American influences. The programme included Takemitsu Wind Horse, John Luther Adams Canticles of the Holy Wind (UK premiere), John Cage Living Room Music, and Barber Agnus Dei. CALL TO SINGERS If you are a strong choral singer interested in joining our enthusiastic membership, please get in touch. DONATE TO NLCC If you have ever enjoyed an NLCC concert or recording and wish to help us continue our unique mission, do please consider donating.